Adrian Beltre makes baseball fun. Generally speaking, third base is kind of a neutral position in terms of defensive value. It’s neither as demanding as shortstop nor as easy to pick up as first base; the role’s importance depends on the player who takes it on. And just like Baltimore Orioles great Brooks Robinson a half-century before, Beltre has turned the left side of the diamond into an impenetrable stronghold. Defensive values are an average of metrics from Baseball-Reference.com and FanGraphs.com. Starting at an extremely young age, Beltre was already showing all the characteristics of a future star. (In fact, he was so good as a 15-year-old in 1994 that the Los Angeles Dodgers broke MLB rules to sign him out of the Dominican Republic.) A major league regular by age 20, Beltre became one of only 26 hitters since 1901 to record 800 plate appearances before turning 21. And his slick defense was as good as advertised from the very start. 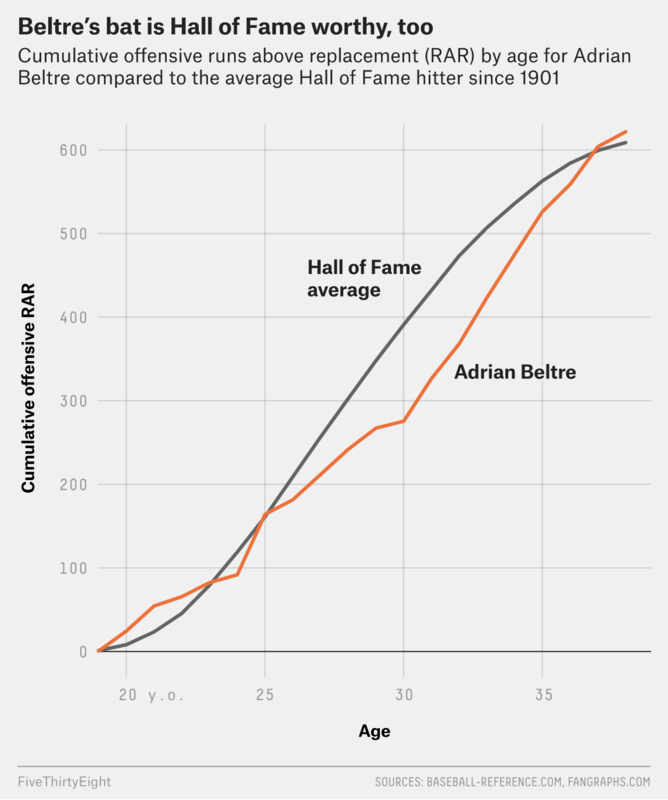 But Beltre’s hitting wasn’t always on a Hall of Fame trajectory. His career adjusted on-base plus slugging (OPS+) through age 30 was only 105, barely better than average. Since then, though, Beltre has been hitting the cover off the ball, with more than 200 home runs and an OPS+ of 134 from 2010 onward. As a result, his lifetime offensive value — the number of runs he produced above replacement with his batting and baserunning2 — has climbed sharply over the back end of his career, to the point where his offensive output has finally chased down the average for Hall of Famers at the same age — and that’s on top of his great defense. Beltre was once held up as the poster child of players who turn on the afterburners in contract years, then coast until it’s time for another payday. And certainly there did seem to be a pattern to the ups and downs of Beltre’s early-career performances: A mediocre 97 OPS+ from 1998 to 2003 (his final arbitration-eligible season with the Dodgers) was followed by a stunning 163 OPS+ season in 2004. Then he put up a 101 OPS+ with Seattle from 2005 to 2009, before signing a one-year deal with the Boston Red Sox, whereupon he posted a 141 OPS+ in a make-good 2010 campaign. Walk years include 2004, 2009, 2010, 2015 and 2016; normal years include all other seasons. That has been especially true since Beltre joined the Rangers and teamed up with shortstop Elvis Andrus. Between pantomiming invisible fly-ball catches, tossing his glove at Andrus in retaliation for the shortstop’s relentless campaign to touch Beltre’s head, and staring Andrus down for prematurely settling into a home run trot, the left side of the Rangers’ infield might be baseball’s best comedy duo since Abbott and Costello. It’s all part of the game for Beltre, one of the most entertaining — and talented — players of his generation. A few years ago, my colleague Harry Enten and I worried Beltre was too underrated to make the Hall of Fame. But now that he has joined the 3,000-hit club, there can be no doubt about his place in Cooperstown. Which I calculated by averaging together Baseball-Reference.com’s and FanGraphs.com’s defensive metrics, including their respective position adjustments. Again, averaging together the Baseball-Reference.com and FanGraphs.com versions of each statistic. Average weighted by plate appearances. 2004, 2009, 2010, 2015 and 2016. I ran a two-tailed t-test between the two sets of seasons, and the p-value was 0.40.